So I did some reading, talked to a few people online, and decided that my ideal option, in terms of amount of maintenance, potential impact, potential for outreach, and amount of enjoyment, was to raise a small flock of chickens in conjunction with a produce garden. There was a problem though. I rent my house, so permanent changes to the yard or house were out of the question. Anything I built had to be removable and visually appealing. My first order of business was to design a structure that would eventually become the Pico-farm*. The Pico-farm is a 16 sq. 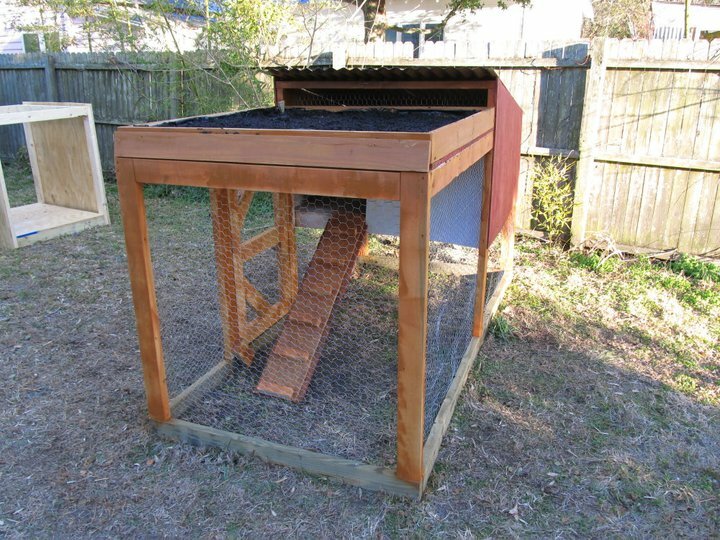 foot chicken coop with a 32 sq. foot run suitable to house a maximum of four chickens. There is a 16 sq. foot green roof on top which produces lettuce, tomatoes, several herbs, and peppers. A rain barrel on the back collects runoff from the roof and stores it for watering. When properly established, is semi-self-sufficient. The chickens need additional food, but can survive off collected rainwater and their food is supplemented with scraps from the roof garden. Chicken waste is collected and added to a compost pile, which then goes back into the garden. The landlord was happy when I added that once the pico-farm was removed, the land under the chicken run would be exceptionally fertile for a future garden. There are several good reasons to raise chickens, but the most compelling is a ready supply of farm-fresh eggs, free of antibiotics and hormones. From an animal welfare perspective, backyard chickens aren’t subjected to the unpleasant and unsettling conditions of a factory farm (although you can rescue battery chickens, they’re usually killed after the first year and some factory farms will let you take some, since the meat can’t be sold). A pico-farm is about as local as you can get. Compost made from chicken waste is excellent fertilizer. Finally, chickens are fun. Depending on the breed you get, they can be very personable, they’re entertaining to watch, and they’re a great educational tool for teaching children about biology and getting people to think about where their food comes from. If you’re thinking about sustainable pets, chickens are near the top of the list. Thanks to the magic of Google SketchUp, I can share the original designs for the Pico-farm with anyone who’s interested in building it themselves. To the right is the basic frame, built with 2X4’s. The base is pressure treated to resist rotting, but the rest was built almost entirely of reclaimed material from a near-by construction yard (always ask permission before raiding a construction dumpster). To the left is the Pico-farm with the hen house added. The plywood was mostly recovered material. The tin for the roof was purchased new, but I could have probably found tin somewhere if I spent more time looking. 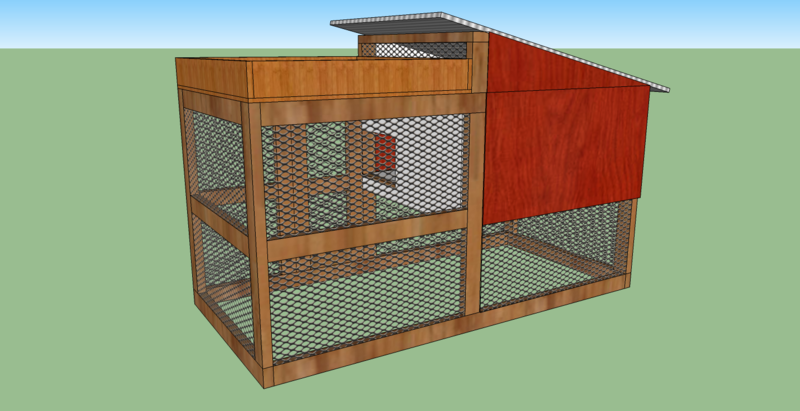 One of the panels is hinged so the the entire wall opens up to access the hen house, clean up, and collect eggs. And finally, below is the finished project, with green roof and hardware cloth installed. The green roof is made from pressure treated 1X6’s with a layer of heavy plastic underneath to prevent leaking into the run. I originally installed chicken wire, but discovered that foxes and raccoons can shred chicken wire like string cheese, so pulled it all out and replaced it with 1/2 inch hardware cloth. The hardware cloth was the biggest expense of the entire project. 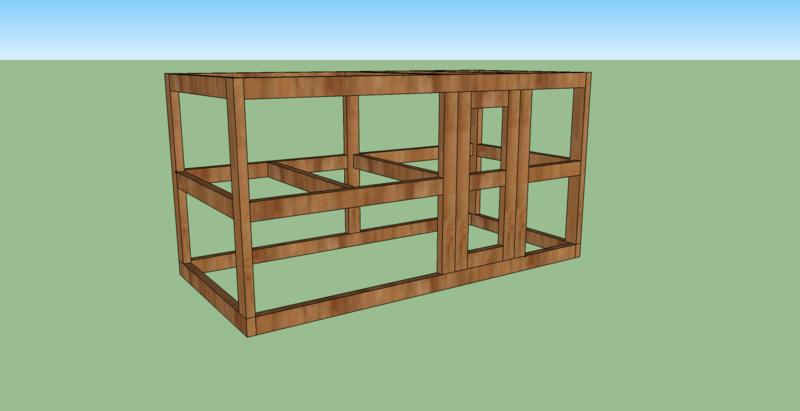 You can download the complete Google SketchUp Project here and modify it as you see fit. My only request is that if you credit Southern Fried Science and myself for the design if you get any publicity or broadcast your project in the media or on a blog. Front view of the Pico-farm, at the end of construction. 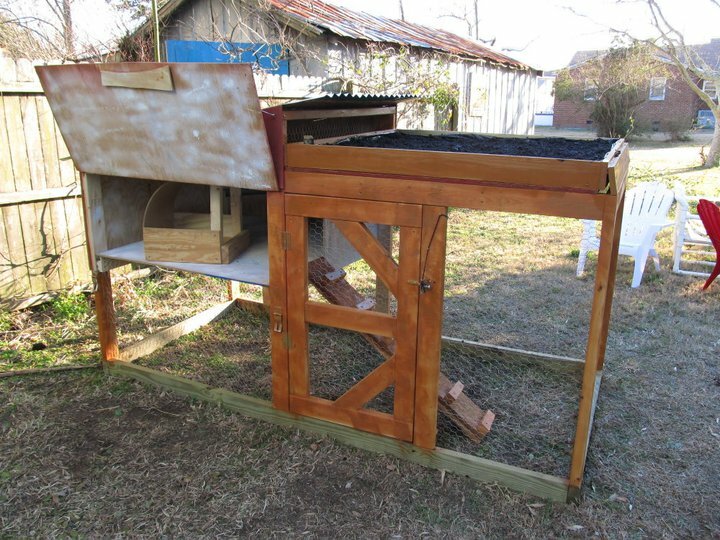 Side view, with the coop door open. 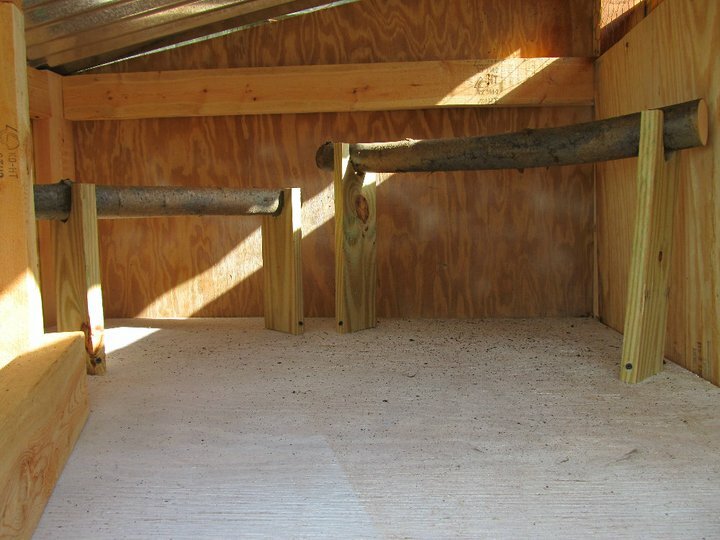 Inside the coop, with two roosts made from scrap wood and willow branches. Here’s the final product, stocked with chickens, lettuce growing on the green roof, and a rain barrel in the back. All told, the Pico-farm cost about $150 to build, most of which was in the cost of tin and hardware cloth. Upkeep is minimal, and the cost to feed the chickens averages about $10 per month. Once the chickens are laying, the hen house has to be checked everyday for eggs. When completely established with a laying flock of 4 chickens and a vibrant green roof, this set-up, in conjunction with a few other small garden beds (which are also fertilized with chicken compost) supplies about 10% of our food. Not bad for a 4 by 8 foot plot of land. Probably the most rewarding outcome of this endeavor was the community outreach. As soon as the coop went up, I had neighbors coming by to check on the chickens, asking how everything works, and in some cases, deciding that they too would try their hand at a pico-farm. Before the first eggs were laid, I had already installed another pico-farm at a friends house. Even my acquaintances who don’t think about conservation and sustainably like the practical aspects of the Pico-farm. No matter how much writing you do about conservation and sustainability, nothing has as much impact as showing people the the benefits of a slightly more sustainable lifestyle. Today, Americans are celebrating Independence Day. Don’t forget that a sustainable lifestyle is an independent lifestyle. And because I can’t resist, here’s the award winning video we made about backyard chickens. *Why pico? This set up is approximately 9 orders of magnitude smaller than a million acre farm. Plus, nano-farm sounds silly. Cool little rig. We are going downsize our gardens etc in a couple of years and appreciate your efforts to keep it simple. Thanks and good luck. Question: what happens in the winter? we live in the cold northeast, and I cant imagine these little fellas are gonna make it. Chickens will survive down to freezing just fine, depending on the breed. After that you’ll have to run some heat out to the coop. Love this! My flock is eleven birds so I need something bigger, but you have given me a great idea with the slanted roof and rain barrel. Brilliant! What a great design! I just wish I could convince myself that I can have dogs and chickens both in my little yard. Wow! 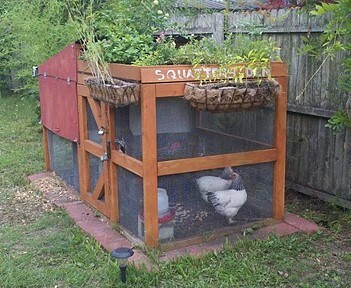 That is just about the coolest chicken coop I’ve ever seen!!! Ours is completed already but I might steal your rain barrel idea. I really like the setup and have raised chickens here in Mass through the winter without problems. Below zero no problems as long as they can get out of the wind and huddle together. Also they need to have access to fresh unfrozen water. I raised barred rocks but I am sure there are other breeds that are as tough. Being able to move the setup makes for a great garden spot on the evacuated area. No bugs, no weeds and high fertility. Great eggs and compost. Sounds like I am going to raise chickens again. Pico-farm. I like it! Smaller than micro-farm. Me all the way. Hoping to get chickens next year. Had them as a kid, so know what I’m in for. Have a small garden cart that I’m planning on building their coop on – so I can move them around easily. It’ll handle 250#, so it shouldn’t be an issue to expand it to hold 4-6. Then can park it on south side of house for winter. Just got started with chickens this year and am anxiously awaiting the first egg. I’m definitely going to adapt our coop for the rain barrel. Great idea. Chickens will survive temperatures well below freezing. I’ve kept chickens here on my farmden for years in a very roomy and very well ventilated chicken house with no supplemental heat ever. I have Bantam chickens. They don’t lay in winter but they surely don’t freeze.